Twentieth century revelations of the Sacred Heart of Jesus to a young Spanish nun. Undoubtedly most inspiring and influential book. Makes lasting devotees. In print since 1949. Sister Josefa Menendez was a Coadjutrix nun and author of the nineteenth and twentieth centuries. Born in 1890 to humble parentage, she was received into the Reparatrice Convent at the age of twenty-two, and thereupon embraced the religious life earnestly. She was a loving, sacrificing woman who also knew how to be both serious and lively. 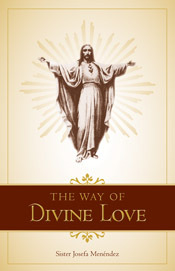 Her written works include A Call to Souls, Christ's Appeal for Love, I Wait for You, and The Way of Divine Love. Sister Menendez died in 1923.